This is about how I make the prosthetics I use for Haku. I know they're not high quality or anything, but it's easy to do. I am using pieces I have previously made in order to demonstrate this construction (I'm not remaking everything). You may have to use your imagination just a little. Also, my pieces are only about 1/4" thick, maybe a little more. I'm not entirely sure how this would work with much thicker objects. What we are going to be doing:We want to make the positive for a latex prosthetic. We need to make a negative mold out of plaster. When you pour liquid latex into the mold the plaster will gradually draw the moisture out of the liquid latex turning it solid. 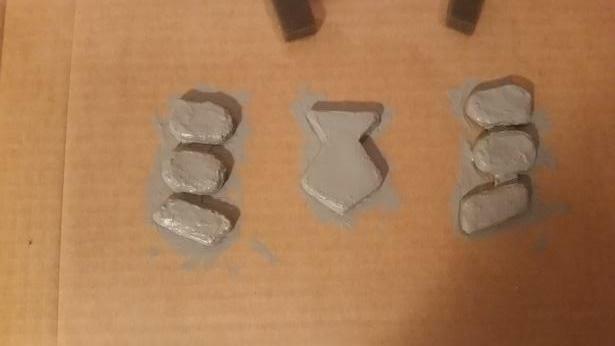 To make it we first need to make a positive of the object, then a negative out of plaster, then finally a positive out of latex. First you need to use your Sculpey to make the object you want to make out of latex. After you have made the object you can bake it or not, there are pros and cons to doing both. My forehead piece. I had baked it and done something else with it before using this process. 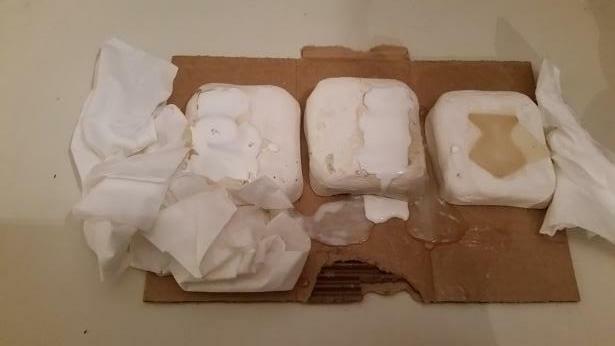 - If you don't bake it then you should be able to get the sculpey out without much worry of cracking the mold, however it may take more time to get all of it out of the mold if it is stuck. You may want to use flat toothpicks or something like a toothbrush to clean the mold. - If you do bake it, then you really need to cover the object with a mold release agent before pouring the plaster. I used a light coat of Vaseline. Let me say this, I was very gentle taking the pieces out and it took a long time. 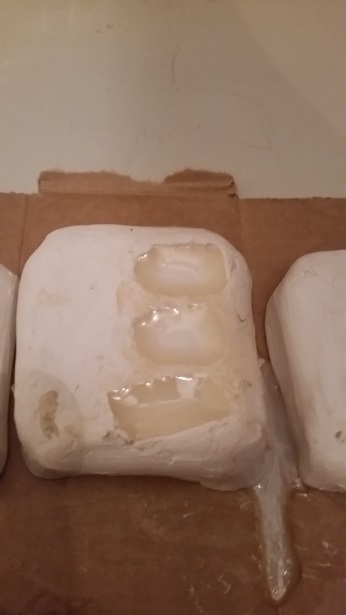 I really have no idea how I didn't crack or gouge the molds. - Easiest is to do to the dollar store and buy a pack of the cheap tupperware containers. You'll have no setup time and be able to cut it away and toss it without much expense. - Cardboard is also cheap. 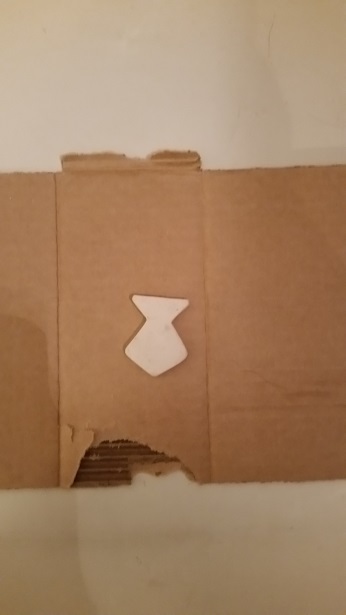 Lay your piece on the cardboard, then take two pieces and bend them into L shapes. Tape them all together to make a box with its top open. You MUST now seal all the seams with either Sculpey or hot glue, don't forget about the seems where the L cardboards meet the surface cardboard where your object is resting. The reason is because you really do not want liquid plaster leaking and spilling everywhere. - Legos is another pretty decent way to do it. you need a flat bottom piece and lots of other pieces to make walls out of. 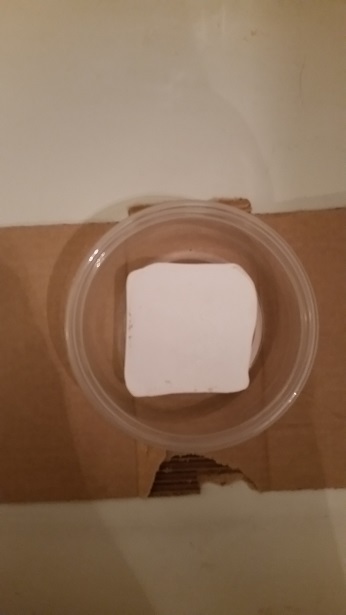 You shouldn't need to seal the seams for this process, however I would put a layer of Sculpey on the bottom so that the plaster wont seep under your object and end up encasing it. Make sure you follow all the directions for plaster of paris, table banging for the bubbles and all. If you have a vibration table, then good for you. I used cardboard when I originally made it and sealed the seams with hot glue, but this container would have been a ton easier. Now you tear away your container and remove your sculpey object in the manner of the state it is. After it is out you should inspect it for any defects. Now is the time for sanding or alterations. If there are any bubbles you can fill them with a bit of sculpey. 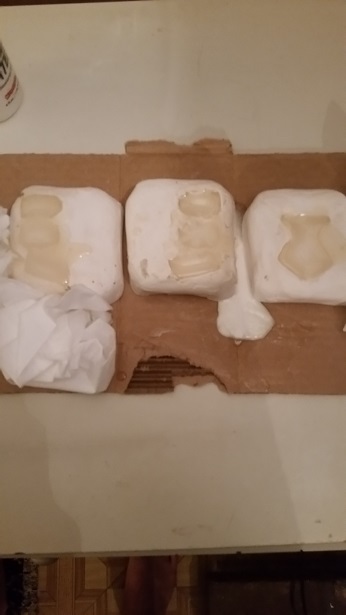 A bit of it in the mold shouldn't affect the latex drying process much. The hard part is over. You now have your mold to make as many pieces out of as you want. The only downside to this is that it takes a while..... like hours. But on the up side, you don't have to do a thing and you'll end up with a solid piece. This time I am using http://www.amazon.com/dp/B011X3C8CK. I wanted to see if there would be much of a difference with higher quality material. In the past I have used other cheaper liquid latex from costume shops and they work just fine. 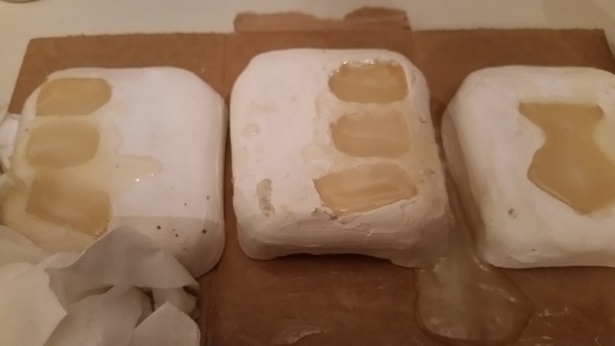 You may want to put your plaster mold in a container or put paper towels under it, the reason will soon become self-evident. 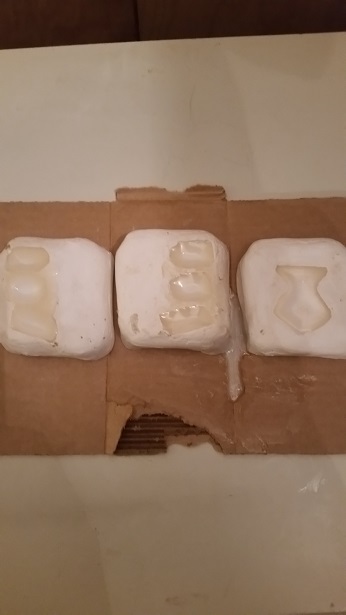 Just pour the liquid latex into the mold. 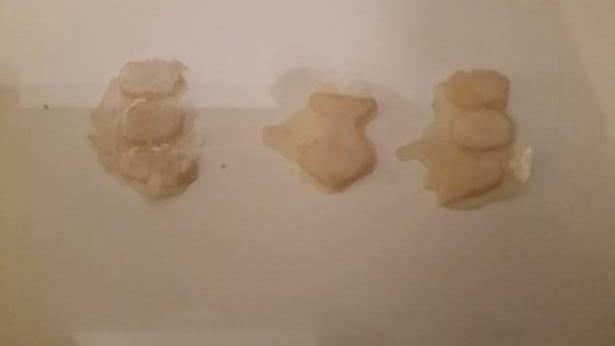 All 3 of my molds... and a small spill. Now wait. I usually pour them before bed, check them in the morning, adjust, go to work, check them when I get home, adjust again. 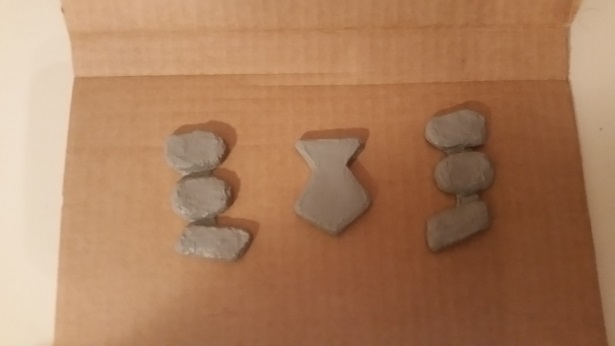 After some hours they have fully dried and hardened. However, since the plaster wicks away the moisture and leaves behind a solid, some of the volume has been depleted. This means it takes multiple pours to achieve a level surface. I have noticed that it doesn't really matter how much time has passed after the latex solidifying, the new liquid latex will always bond to the solid latex. Closeup showing the cavities. You can see it easiest in the bottom one. At this stage I pour the latex into the cap and then from the cap into the cavities for easier flow control. ...Which I remembered immediately after having another large couple of spills. After another day... or work... I don't remember at this point. But it's dried again. Smaller cavities this time. Not much left to go. A thin layer on the spots I thought needed a bit more. After you have a flat surface on the back after it has fully dried, you now need to carefully demold it. 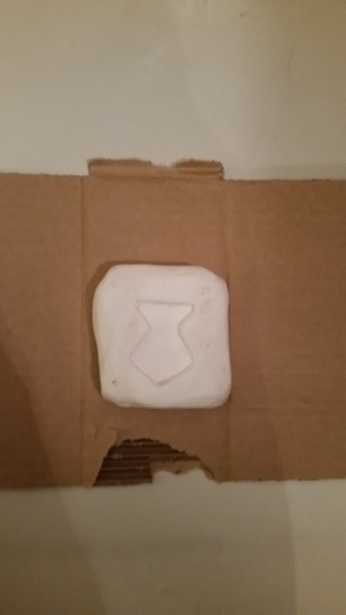 Basically just carefully peel it out of the mold. I usually use a knife and trim away a lot of the excess latex if I have spilled it all over the place... It happens. Now trim away the all of the excess latex. I guess you could call if flashing if you want, but whatever, make it look nice. A hobby knife is all thats needed, but some kind of clipper tool can help also. After that's done, give it a gentle wash to remove any plaster. Time for paining. 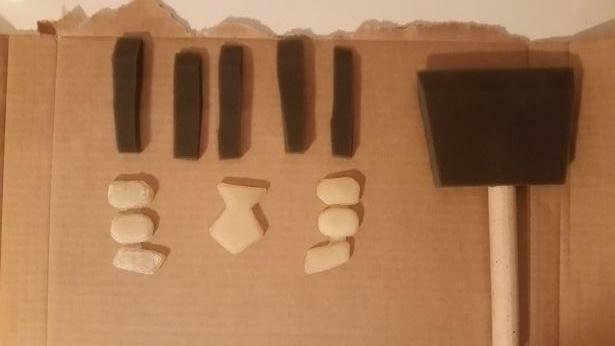 I get a black foam sponge brush, pull out the plastic insert, cut it in half so I have two long wafers, then cut into small sections. This helps me get between the pieces better and also gives me more brushes. 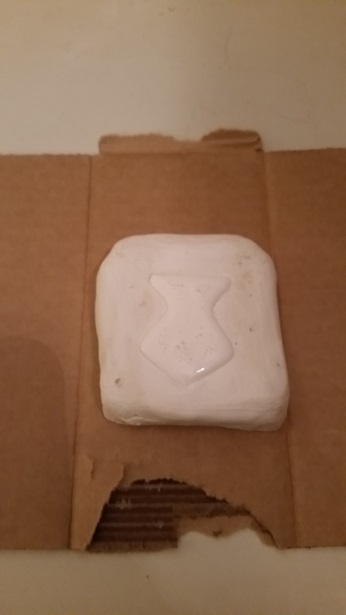 The latex will dry in any brush you use and destroy it. These are super cheap. Cleaned up with brushes ready. For the paint, I do acrylic paint mixed with liquid latex at about a 1:1 ratio. It's kind of hard to tell what the right mixture is. 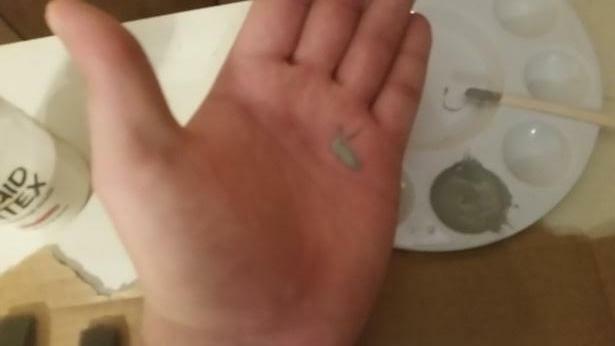 It's difficult to see in the picture, but what I do is use my mixing stick and paint a thin layer on the palm of my hand (if you do the back of your hand, the latex will stick to the hairs), blow on it a bit to dry quickly, then rub it a bit to see if it crumble up like liquid latex does and doesn't leave any paint on my skin. That should be a decent consistency. NOTE: The color of the mixture is going to be lighter when liquid and darker when dry. 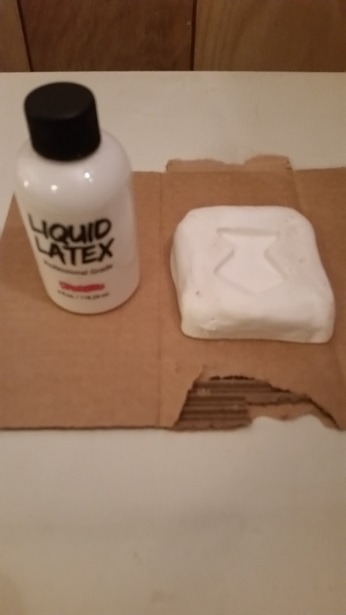 The latex when liquid makes the mixture light, but when a thin layer of liquid latex dries, it dries clear, this causes the acrylic paint to show its true color. You can kind of see with my mixture, to how it is when its dry. Kinda blurry, but hopefully helpful. Also note the color. Paint on a crappy surface. Use cardboard or something. You'll have to cut away the excess painted latex. It's easy this time though. 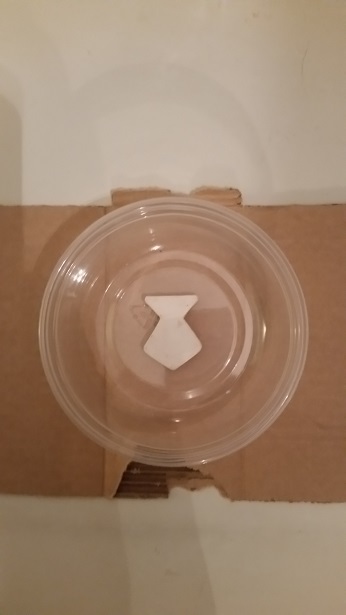 Just as a note, if you have a gap between the bottom of the piece and the cardboard, some latex may get underneath. It's not generally a problem for me, but eh. Also, remember to paint the sides, we want all of it covered. Wet paint. Try to paint in one direction or it looks odd and causes streaks. Depending on the color and consistency of your mixture you may need to do multiple layers. I generally do at least two as a fact in case any spots need covering. I usually give it about 15-20 minutes to dry between layers. When you're done cut away the excess. If you make your pieces like I did, be careful not to squish them together too much. 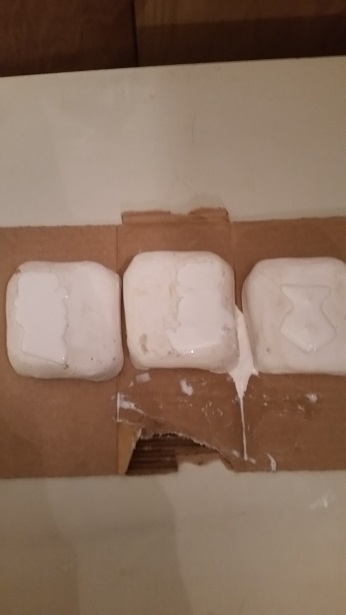 If they're not dry enough the latex on one part will stick to another part. Or you could just wait a day or whatever till it's fully dry. I'm impatient sometimes. Now you can make and remake as many as you want. To apply use spirit gum or Prosaid. I've noticed that even with cleaning, after a while they get kind of gunky and sticky. Good thing they're so easy to recast and make. I could go on, but I'll wait till i actually do it. After this, it's just demolding, cutting off the extra latex, and painting on a colored layer. I generally do a 1:1 ratio of acrylic paint to latex, mix it, and paint it on. Bumping cause I finished. Wheee.